Scoop ice cream into 8 1/2-cup sized balls. Place on a baking sheet and freeze until firm, about 1 hour. In a shallow dish, combine cornflakes, cinnamon and pepper. In another dish, beat egg whites until foamy. Roll ice cream balls in egg whites, then in crushed cornflakes, covering ice cream completely. Repeat if necessary to coat completely. Freeze again until firm, 3 hours. In deep fryer or large, heavy saucepan, heat oil to 375°F (190°C). 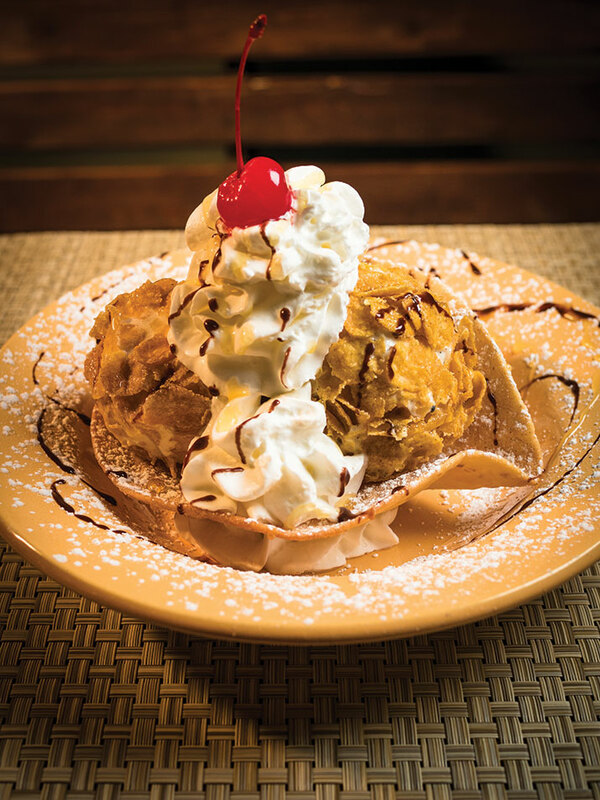 Using a basket or slotted spoon, fry ice cream balls 1 or 2 at a time, for 10 to 15 seconds until golden. Drain quickly. Place 2 scoops in tortilla bowl and drizzle with chocolate syrup and honey. Top with whipped cream and then shake on a light coating of cocoa powder. Serve immediately.